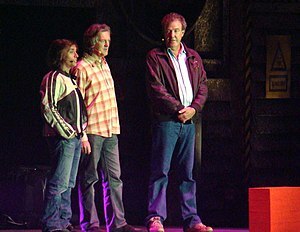 Lord Jonathan Sacks took the unusual step of criticising the UK’s ‘pervasive breakdown in trust’ while standing next to a large cardboard cut out of the Top Gear presenter. Without directly referring to Mr Clarkson, the Rabbi lamented the collapse of the institution of marriage, the coverting of Kristin Scott Thomas and the deflowering of James May. Furtively winking and pointing towards the ‘Clarkson cut out’, Lord Sacks criticised people who seek only to ‘benefit’ themselves, wear denim and smell of woodbines. The, soon-to-be retired, Chief Rabbi reiterated that he was talking in general terms and that no inference should be drawn from the photo’s of Mr Clarkson’s ‘extra-marital activities’ he was waving in his hand. No stranger to controversy, Mr Clarkson’s own playful racism is often excused by his employers at the BBC. TV executives feel it is a harmless ‘twinkle’ in his eye, in the same benign way Jim Davidson has a ‘song in his heart’ and Jonathan Rhys Meyers has ‘vodka for blood’. The spokesmen clarified: ‘Lord Sacks is not saying Chipping Norton is Gomorrah. That would be wrong. It’s for you to draw your own conclusion,’ he said, with a surreptitious twinkle in his eye. This entry was posted on August 26, 2013 by Wrenfoe in UK News and tagged Chief Rabbi, Chipping Norton, Clarkson, Flib News, Jeremy Clarkson, Jonathan Rhys Meyers, Jonathan Sacks, Kristin Scott Thomas, Lord Sacks, Rabbi, Satire, Stig.